The application of an engineering mindset could help relieve pressure on the UK’s NHS and even improve patient care. This is the key message of a newly published cross-disciplinary report from the Royal Academy of Engineering (RAEng), the Royal College of Physicians and the Academy of Medical Sciences. The NHS is one of the UK’s largest and most complex organisations, and faces a number of well-known challenges, from the impact of real-term reductions in government spending to the pressure of a growing ageing population. The RAEng-led report “Engineering better care: a systems approach to health and care design and continuous improvement” claims that it will only be able to effectively meet these challenges by applying the kind of systems-level approach common to engineering, an approach that gives careful consideration to the way every element of the system- in this case patients, carers, clinicians and other staff – interacts. In engineering we are well used to dealing with things that are complex – the question is can we help deal with the complexity that emerges in healthcare? The report was based on the findings of series of workshops led by the Royal Academy of Engineering but involving more than sixty leading engineers and clinicians. Clarkson said that despite the size and cross-disciplinary nature of the group, there was a real appetite amongst all involved to come up with practical solutions. “You’d think it would have been a difficult thing to do but when we raised the topic with people in both communities we weren’t short of people who stood forward and wanted to take part,” he said. Clarkson added that bringing different areas of expertise together was not only key to identifying the challenges but also in finding a way to describe the systems approach in a language that’s accessible to healthcare workers. 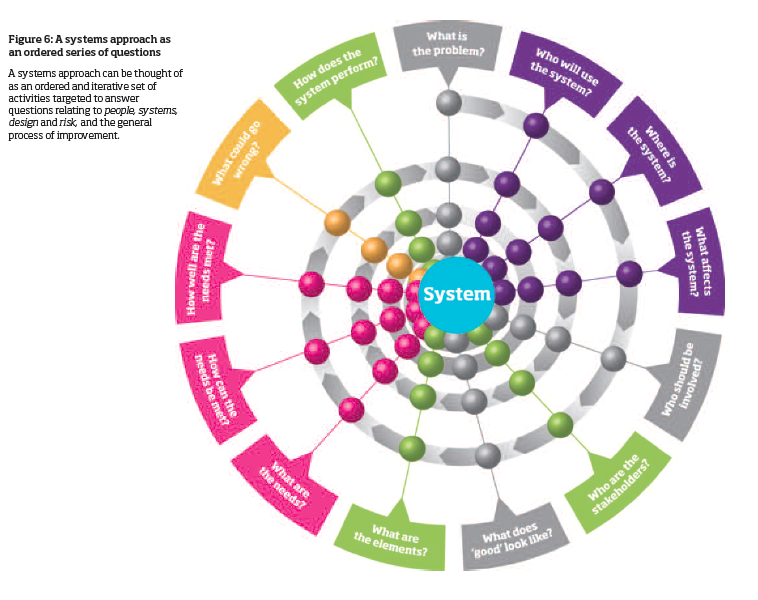 The result is a series of 13 project related questions – such as “What is the problem?”, “Who will use the system?” and “Where is the system?” which, said Clarkson, can be applied in an iterative way to any process. Nice idea, but it ain’t never going to happen. The NHS floats in a media supported “cannot be wrong” alternative world. They have a culture where criticism is shunned and errors are invisible. This is a complete anathema to effective problem solving. And not just the NHS, but the civil service, police, politics and more would also benefit! I think anyone with any knowledge of Lean is amazed by the amount of waste in a hospital. So true – I offered to help one department foc a few years ago but because I was not a preferred supplier they could not take me up on my offer ! Take a look at the PEARS project as an example (www.exstent.com). An engineer has transformed the treatment of asymptomatic aortic dilation giving patients a better outcome, a shorter surgery, less time in hospital, all to the benefit of the NHS, yet the number of cardiac centres offering PEARS surgery is still small. Properly engineered solutions to many problems in the NHS will offer huge cost savings, but the NHS needs to wake up to these opportunities. As I understand the health system the most difficult aspect of costing is the split between hospital and general practice / social care. The Commissioning Groups are at present dominated by GPs, but these have little or no control over hospital costs. The system aspects of the health service management could certainly use more engineers, but I would question whether engineers could understand health economics as well as health professionals. This is similar to the control of UK industry by Business Management graduates and Accountants: they have a lot to contribute but should not control businesses of which they only have a little understanding: this change has reduced long-term thinking in UK industry to a 3 month cycle. Anyone who has run a business can see what is wrong with the NHS. 1. It is not customer focused, why because it does not have to go out and find customers like industry. 2. It just lacks proper management and discipline. Take a look around a hospital and it is depressing, with drab working conditions and lack of pride in the working environment and personal appearance. 3. From very recent personal experience the problem is not at the coal face i.e. the doctors and nursing staff, far from it as they were excellent. 4. It is the administration or total lack of !!!!!!!!!!!!!!!!!! It took me back to my time in the Royal Air Force and is reminiscent of the NAAFI, the services equivalent to today’s coffee shop. NAAFI stood for Navy, Army, Air Force Institute or as it was more often known by us erks as No Ambition And F___-all Interest. It needs people who understand managing and motivating large teams. It needs to instil PRIDE and PURPOSE in its administrative staff. It also does not need layers of bureaucracy or unions. Having had a great deal of personal attention from the NHS, and also my father has had significant care with a broken hip, I cannot fault the treatment recieved at the “coal face”. In both cases this has been excellent. I have also had considerable experience working for the MOD. One problem common to these organisations is procurement and purchasing. They have preferred suppliers (for years), so it is not worth anyone competing to supply, as someone said in a previous comment. If procurement and purchasing were to follow engineering principles, I’m sure that over- and under-supply would be greatly reduced, and therefore costs would be also reduced, both by using lean principles, and competition to supply. I’m positive that other savings could be made by running the NHS on sound engineering business practices. On finishing work I developed Gout, a form of Arthritis. I have gained relief by loosing weight, avoiding or at best limiting certain foods and substituting Cider for Beer and White Wine for Red Wine. There appeared to be little or no interest in a programme to treat the condition other than with High Power Anti Inflammatory drugs. I do wonder how many others suffer from this or similar conditions which would benefit from a holistic approach? I agree, the coal face workers are excellent, however the rest does vary hospital by hospital. One local hospital (there as an inpatient) was abismal in organisation but luiked their photographs on the wall! My other local hopstal (in and out patient), so good that it is taking over other local trusts and sorting them out ASAP. Why? Because the Chief exexcutive knows what he is doing and the staff back him to the hilt.